Making New Orleans more awesome, $1000 at a time. Ride New Orleans accepts $1000 check from Awesome New Orleans!! Awesome New Orleans gives away $1000 each month to projects that make our city…. well, more AWESOME! This month, Ride New Orleans stood out among the 20+ applications with their “Giving Riders the Seat They Deserve” campaign. 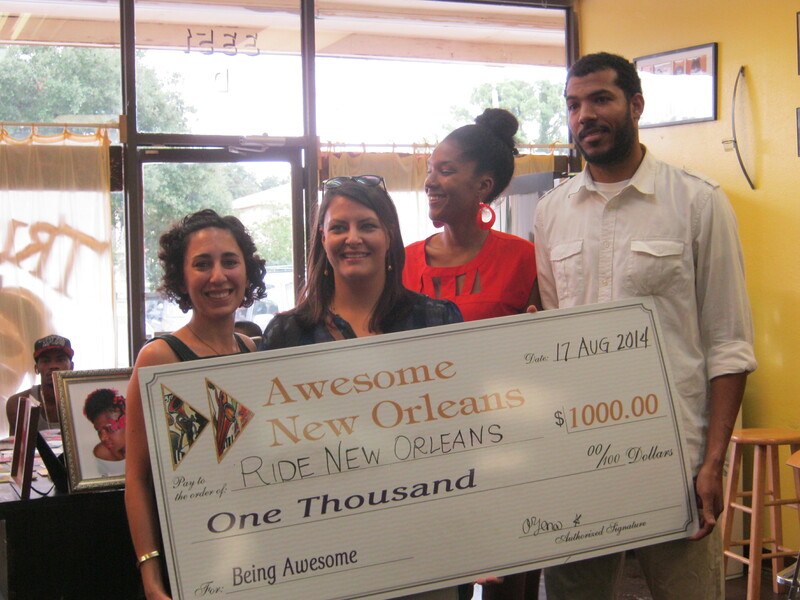 On August 17th, Adelaide and Rachel from Ride New Orleans accepted the $1000 check at our August Awesome Hours event at Tru Rootz Natural Hair Salon on Kabel Drive in Algiers. “Giving Riders the Seat They Deserve” will send a message to decision-makers in New Orleans: invest in a true CBD transfer station that provides basic comforts to current riders and encourages new ridership from tourists and residents who typically drive. More than 40% of RTA riders wait at the transfer point for 45 minutes or longer, and there are no public restrooms, route maps, shelter, and very few places to sit. Awesome New Orleans is happy to support Ride New Orleans in advocating for the rights of bus-riders! How will they use the money? Ride New Orleans will use the $1000 to host their first action and press conference about the poor conditions at the CBD transfer station. They’ll set up 200+ chairs with signs and handouts explaining that transferring riders should have a place to sit. They plan to develop a campaign video and create outreach materials, as well as capture riders’ reactions with mini video interviews and photos of them relaxing in their seats. During the action/press conference, riders will have a chance to sign a petition and join Ride New Orleans’ efforts. Thanks again to Tru Rootz for hosting us! !